A British Army colonel has won substantial undisclosed libel damages against two newspapers that made allegations about his conduct during the Iraq war. 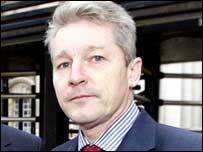 Tim Collins won damages against the Sunday Express and Sunday Mirror newspapers at the High Court in Belfast on Friday. The newspapers withdrew allegations that he had been involved in war crimes including the murder of an Iraqi prisoner. The Northern Ireland army officer achieved fame for his speech to troops of the Royal Irish Regiment on the eve of the Iraq War. Belfast-born Col Collins, 43, was widely praised when he told his soldiers: "If you are ferocious in battle remember to be magnanimous in victory." The Sunday Express newspaper reported in May that Colonel Collins had stood by as a henchman of Saddam Hussein's was allegedly doused in petrol, set alight then shot. In the High Court, the newspaper accepted the allegations were untrue and should not have been published. Colonel Collins was also awarded damages against the Sunday Mirror which reported that there had been an MOD investigation into a claim that nine Iraqi soldiers had been shot dead while surrendering to members of his regiment. The Sunday Mirror accepted in court that the allegations were false and apologised to Col Collins. The amount of damages was not disclosed but was said to be substantial. Col Collins, who was in court for the hearing, made no comment. After the hearing, the officer's solicitor, Ernie Telford, said his client was delighted to "have been vindicated of such distressing and unfounded allegations". "This is one fight he had to win. He has been to hell and back," he added. "This was a hugely important issue he had to fight on his own. He is used to leading his men into conflict for a cause which he believes is right and just, but this time he was by himself. "He put his reputation and his financial security on the line, but he has emerged a stronger person for the experience." Col Collins was awarded an OBE, after being cleared of alleged war crimes committed during the conflict. He is due to leave the army in August. "Colonel Tim Collins came to Belfast High Court to defend a reputation forged in the deserts of Iraq"